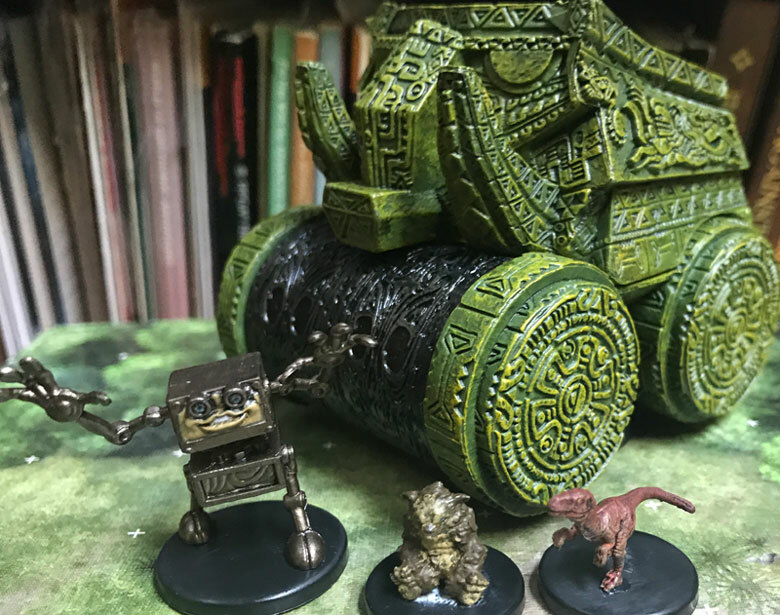 I have been having a ton of fun with Tomb of Annihilation, and one of the joys of any of my campaigns is using cool minis and terrain. 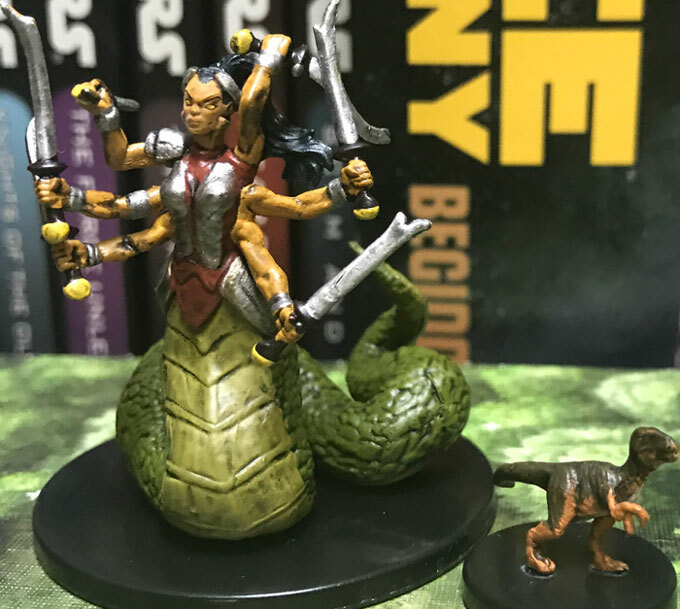 Icons of the Realms: Tomb of Annihilation provides a number of minis supporting the Tomb of Annihilation adventure. Batiri goblins, vegepygmy, velociraptors, stone juggernauts, Acererak, and more! 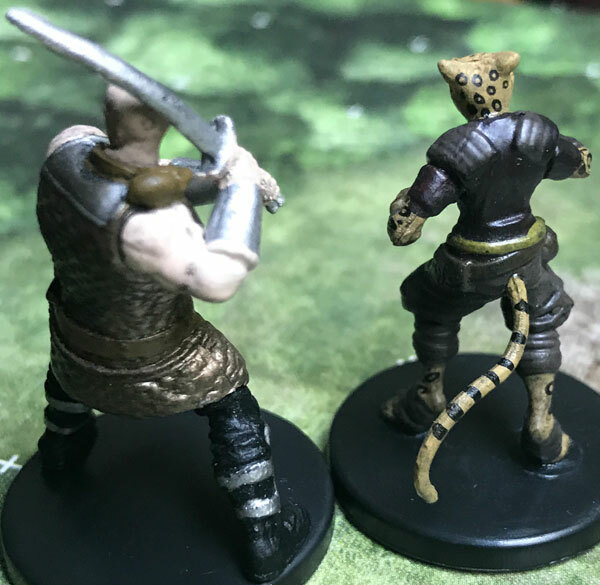 Oh, and in addition to this article, check out my new Miniatures page, including a minis tracking spreadsheet and a way to trade minis with me! 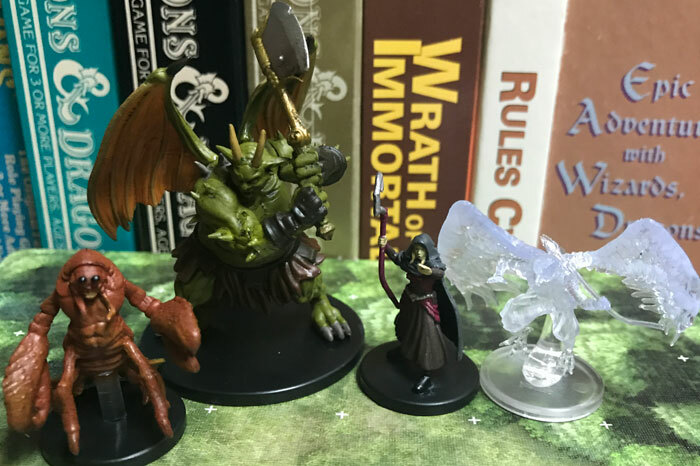 This is perhaps the best WizKids D&D miniatures set to date! 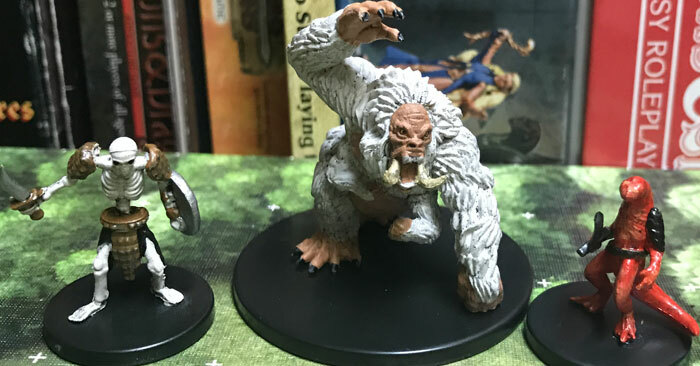 There are some great sculpts, some really useful minis for any campaign, and a lot of minis you want to have when running Tomb of Annihilation. The distribution is similar to the previous set, MMII, and does not suffer from the issues I reported with Rage of Demons miniatures. Adding to the fun is the Tomb and Traps case incentive, which is amazing. You can see the results of purchasing a case below (click images for a larger picture). 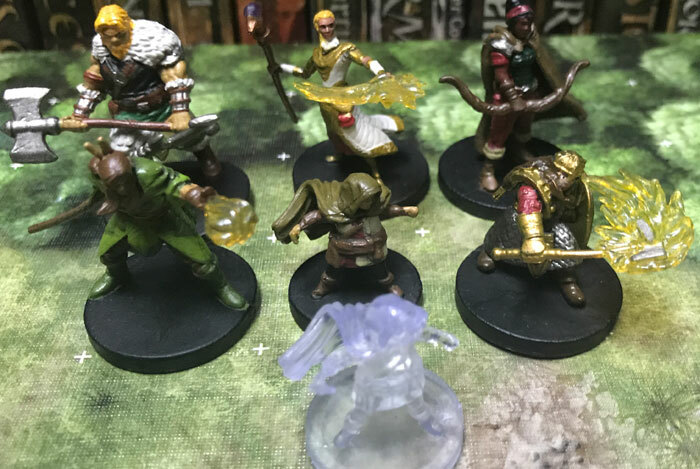 Tomb of Annihilation consists of 56 unique miniatures (plus 10 ultra-rares), sold in booster boxes of 4 randomized minis. You can purchase a “brick” of 8 booster boxes, or a “case” of 4 bricks (32 boosters). The booster’s $15.99 list makes it a relatively good purchase at your FLGS and I always like to support my FLGS when I can. You save a few bucks on Amazon. However, case purchasers should look into sites such as Miniature Market, which has a case for $375, bricks for $90, and boosters for $11.50. The case incentive can be purchased for $70 or your FLGS may have a copy. Within the set, there are 19 commons, 25 Uncommon, 12 Rares, and 10 Ultra-Rare miniatures. Compared to previous sets, 6 more commons and a few more uncommons. A very nice change from the previous set is fewer Ultra-Rares, which are annoying because you usually only get 1 per Brick, which means 4 per case. I mentioned this in my last review and I’m really glad to see the change. If you buy a case you get a complete set of all the commons/uncommons/rares plus the 4 Ultra-Rares. As with recent sets, some minis have variants. WotC saves a bit a cash, but our common and uncommon minis are more interesting and useful. An excellent change from previous sets: no variants in the Rare or Ultra-Rare rarities! You can compare the variant batiri and see other variants in the pictures below. This set has a variety of monsters key to the ToA adventure (and a few not in the adventure). There are fewer standard monsters (2 orcs, but no hobgoblins/gnolls/etc.) which is a nice change for anyone who has purchased previous sets. The distribution is better than previous sets, with commons and uncommons often being minis of which you want several (such as batiri goblins or velociraptors). There are a few other monsters, including amazing modrons and a few outsiders – perhaps related to future adventures? Several notable NPCs are included: Acererak, Artus Cimber, Dragonbait, Minsc and Boo, Valindra Shadowmantle, Nanny Pu’Pu, and Ras Nsi. Fans of the original Tomb of Horrors adventure will appreciate the four-armed gargoyle and stone juggernaut (which is amazing)! You can find the entire list on the excellent Minis Gallery web site. If you want a way to track your collection, check out my D&D Miniature Collection Tracker (and send me some trades). Let’s look at the minis, starting with the case incentive! 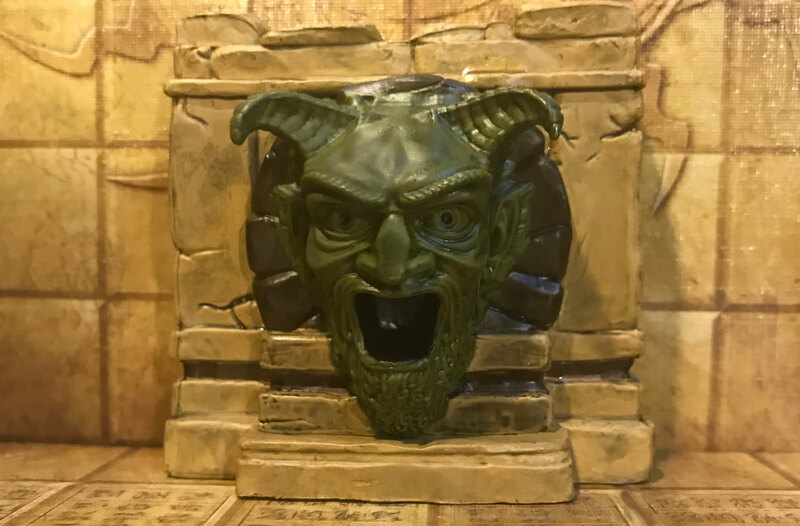 In addition to the super-cool devil face shown at the beginning of this article, it includes a sarcophagus and mystic archway, the demilich skull of Acererak, and 4 piles of gold. It has a nice selection of floor tiles: 4 blade trap, 4 fire jet, 4 magic glyph, 4 pit trap, 4 boulder piles. It also has some incredibly tiny additions: 4 potions of various colors, 4 scrolls, a sword of sharpness, and a shield of missile attraction. These are excellent for ToA or any campaign. Leaving the case incentive behind, let’s look at the minis set by starting with one of the coolest rares, the Stone Juggernaut! A classic found in Temple of Elemental Evil and Tomb of Horrors, this trap/creature is beautifully carved and is a hefty behemoth! We also have the Duodrone modron and Velociraptor (one of two variants), plus the Zorbo (one of the creatures associated with trickster gods in ToA). The zorbo is unfortunately very splotchy, lacking detail and resulting in paint colors running together without any definition. I always like comparing WizKids minis to previous DDM minis. There have been two previous Mariliths, one of which was superb. This version is very nice, almost as good as the best DDM version. You can also see a variant velociraptor. 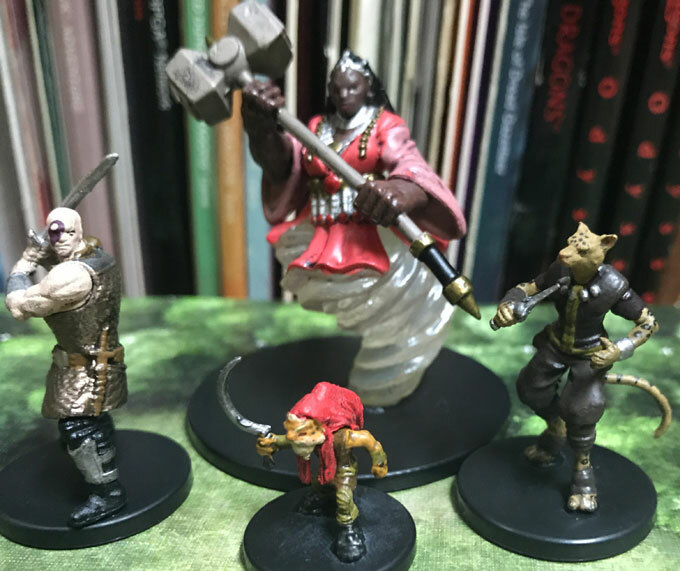 The minis below include Artus Cimber (a great example of how a named NPC works as an uncommon because he can double as an archer or ranger), the leopard with snakes Kamadan, Nothic, and Skeleton Key (one of three variants). The lobster-like Aldani are presented in two variants, and the Nycaloth also is one of two variants. Valindra Shadowmantle is a famous Thayan villain first appearing in the 4E Neverwinter guide and famous to many players for being central to the Neverwinter MMO storyline. This named NPC mini is cool, but again useful for a variety of purposes. Here we can see one of the invisible Ultra-Rares, this one for Asharra (NPC Aarakocra). There are two variant skeletons (seem unnecessary given the inclusion of three Skeleton keys), a girallon (compares well to past DDM versions), and a firenewt. All are very useful for ToA. Minsc the warrior and his miniature giant space hamster Boo appear, as does a Dao, Redcap, and two variant Tabaxi. 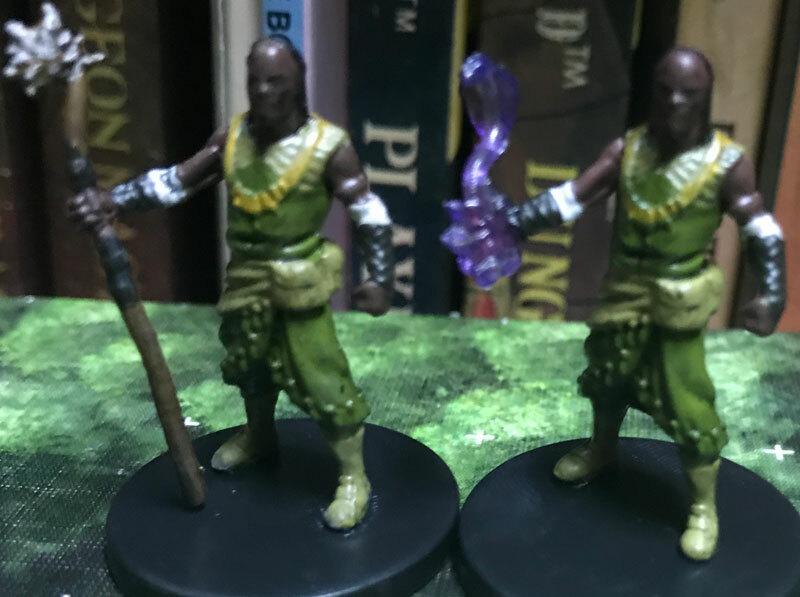 You can see the detail work for the rare Minsc and Boo is not as amazing as better DDM rares, but is still sufficient (that’s Boo on his shoulder). I like the stripes and dots on the tabaxi. A giant scorpion is fine. It lacks the details and coloration of better DDM models. A warebear has two variants (axe or hammer). The Chultan Zombie is a nice example of including a monster we may already have, but making it relevant to the latest adventure. The Monodrone is superb. I really love both this named NPC Aarakocra and the Mantrap plant. I received several in my case and was really glad to have a bunch of these plants. The big bad of the adventure (no real spoiler, Acererak is on the cover) has a mini resembling the cover of the Dungeon Master’s Guide, and the Giant Four-Armed Gargoyle makes an appearance. Dragonbait (known to many from an old Forgotten Realms novel) and an invisible Ultraloth. Here is the regular Ultraloth, the second Skeleton Key, and a Yuan-Ti Broodguard. Two cool NPCs: Nanny Pu’Pu and Ras Nsi, plus a Draegloth. All three are rares. We didn’t need more Orcs, but we get one with two variants. There is also a Vegepygmy and the Vegepygmy Chief (shown below). I was fortunate to write the 4E Ecology of the Vegepygmy for Dungeon 201, so I loved seeing them in this set. Another Skeleton Key is shown here as well. There are a few more minis shown below, including a large Merrow, large Pterafolk, and a Couatl. All three are very cool and can be seen, along with the invisible Ultra-Rares, in this gallery. You can also check out Mark Hulmes’ video as he unboxes ToA minis. Really nice to see the variants only in the Common/Uncommon categories! Thank you for doing a better job of designating variants with an A or B, and for numbering them together sequentially. Really liked the choices on rarity. Common and Uncommon minis were useful in large quantities, while Rares were generally fine to have as just a single mini. Paint jobs were better than the previous set, but still are splotchy on some minis – especially the small monsters. Minis are still very thin. Probably an attempt to save on plastic, but some of the minis really are too thin for the creature they are representing. They look frail, but are also fragile and can break when dropped or even in play. Let’s focus our news on minis! WotC and WizKids recently launched a non-collectible set, Icons of the Realms: Classic Creatures. This captured monsters from the early days of D&D, several of which are on the cover of the AD&D Monster Manual. 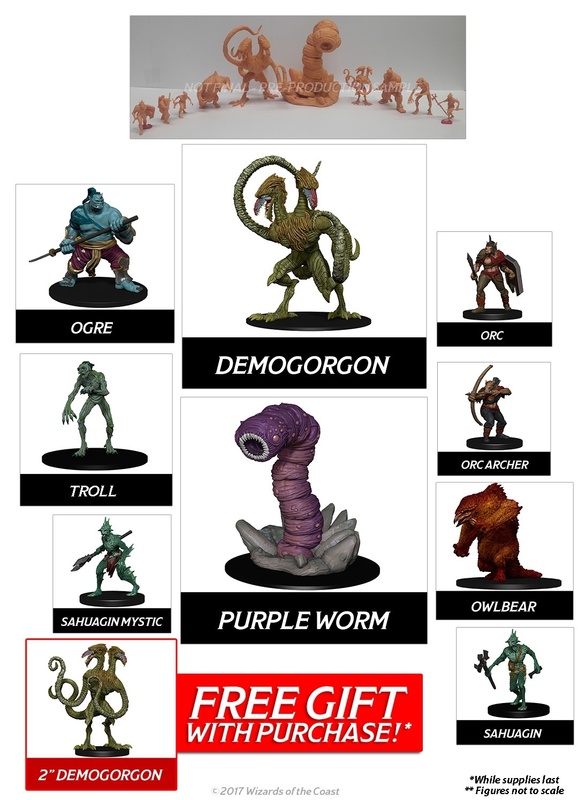 Included are a huge Demogorgon (decent but not excellent sculpt), a very cool huge Purple Worm, large Troll and Owlbear (both with a classic look resembling those in the above image), an excellent Ogre Mage, two Orcs (they are supposed to have classic pig-orc expressions but the detail is a bit poor), and two Sahuagin (a bit thin/frail, but interesting). There is a promotional medium-base Demogorgon, available for free at stores and online shops while supplies last. You can see all of the minis here and here. The set retails for $79.99. What, more minis? Yeah, we aren’t done! 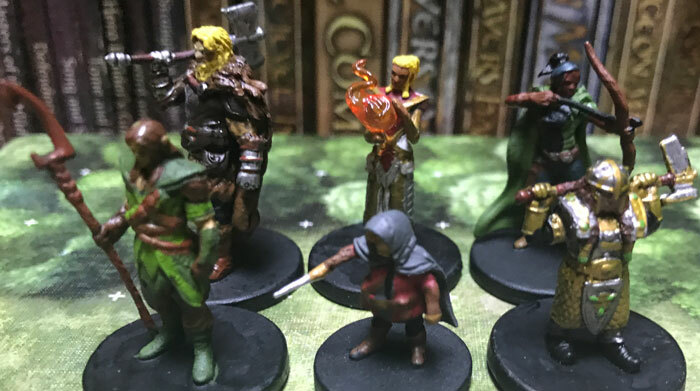 Back when WizKids launched D&D minis they had a Icons of the Realms: Starter set with 5 minis for the Starter Set adventure, plus Drizzt the drow ranger. 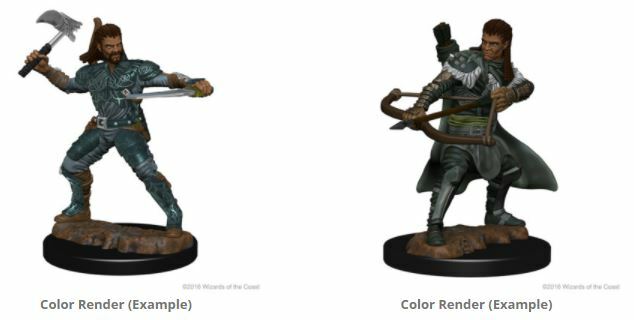 These have been release in variant paints as the new Starter Set, this time with a repaint of the Tyranny set’s druid replacing Drizzt. And, the same heroes are redone again as an Epic set! 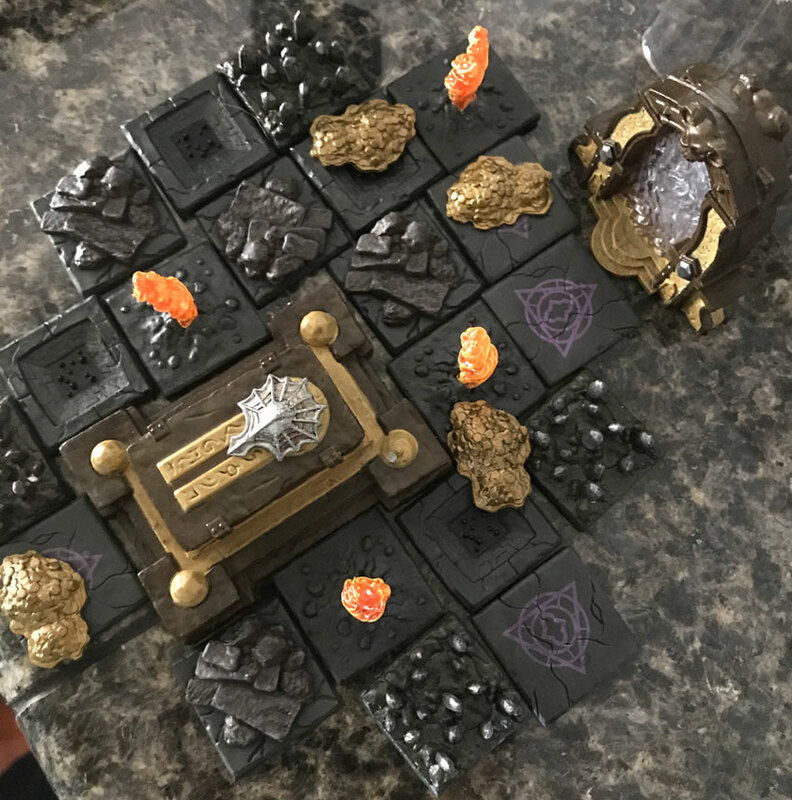 The epic set includes an invisible rogue mini and a battle map. The minis are pretty cool, blasting translucent spells and wielding magic items. 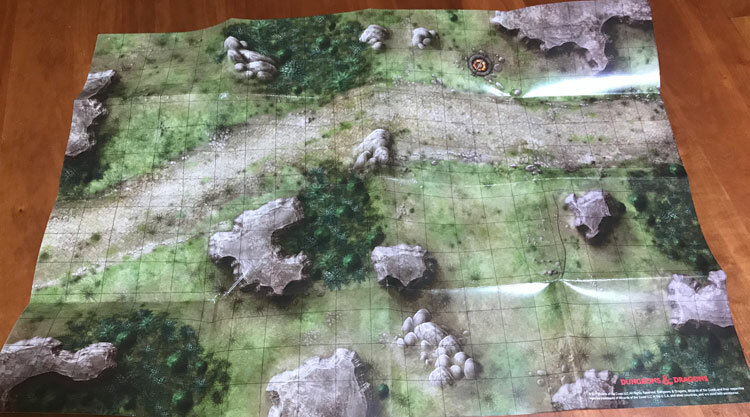 The battle map below is pretty useful for ambushes and overland travel. However, it does come up folded up to fit in the box, and this creates a ton of creases. One of the creases (looks like a black line on the right side near a large dark grey rock) is so deep that I could not easily get it out. Minis actually fall over it. I’ve had it under heavy books for a while, but may have to resort to other tricks to get the crease out. Still, the map is basically a freebie and still useful. 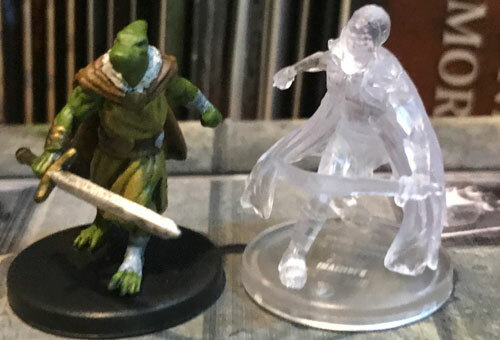 WizKids’ “Nolzur” line of unpainted minis are fantastic. These plastic minis are usually sold two to a package, with a normal and epic mini so you can either have two poses or use one at low levels and one at high levels. The quality is excellent and the price super-low compared to other options. WizKids’ site is a bit hard to use, but you can see all of the Nolzur’s Marvelous Minis here, including painted and unpainted examples. I particularly like how the miniatures depict a wide diversity of body and hair types, capturing the ethnic diversity both of our world and of the Forgotten Realms. WizKids also has a line called Deep Cuts with chests, barrels, and more coming soon. I’ll note that when I see these in person the minis look even better than the web site, which uses computer-rendered images. WizKids also has other upcoming terrain sets. Images from the March 2018 “Pillars & Pools Set 1” are found here. Lastly, WotC has released three sets of dungeon tiles (very popular during 4th Edition) as Dungeon Tiles Reincarnated. There are three sets, each with 16 double-sided sheets of terrain tiles: Dungeon, Wilderness, and City. Each is $24.99 and are in stores now. I am a big fan of mixing tiles into my games, so I hope to be able to review these soon. Thanks for the thorough review of the set. I think I’ve got enough D&D minis but I am tempted by that dao…. Overall, though I find the WizKids minis a bit too small and spindly compared to metal minis or the old DDM figures. I do have a dupe Dao for trade! Let me know if you have something I need! Alas, I don’t have duplicates of anything you need! And, I’m curious. For those that have a ton of minis, what keeps you coming back, or what would get you to come back? 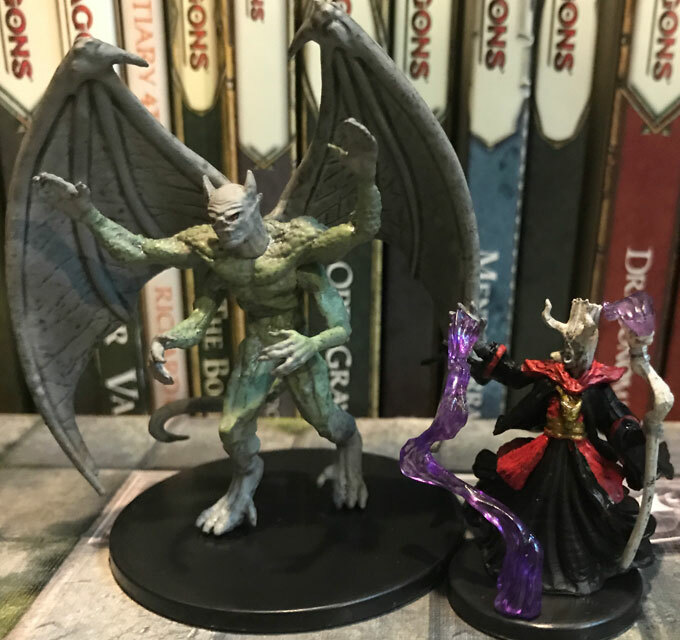 Minis of unique/iconic D&D monsters that I don’t have and use in adventures, sold separately. I have no interest in buying random packs or cases. This entry was posted on January 19, 2018 by Alphastream and tagged Miniatures, Terrain, Tomb of Annihilation, Vegepygmies.